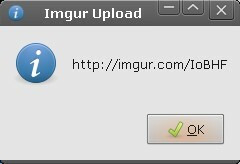 cozzyd (Multumesc, Cosmin) Reddit user wrote a simple Nautilus Actions script to upload images to Imgur.com via right click. 1. Download the script and the .schema files from HERE. 3. Go to System > Preferences > Nautilus Actions Configuration, select Tools > Import Assistant and select the downloaded .schema file. 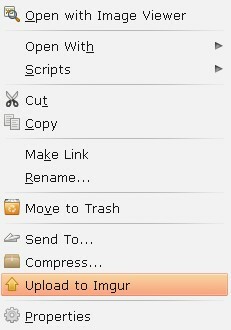 Please note that the Nautilus Actions Configuration under Ubuntu Karmic looks different then it used to (I've just noticed this myself). Once you have completed this, click the second button on the left called "Record all the modified actions".